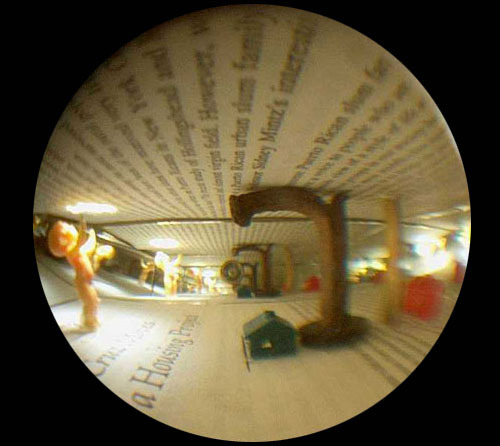 Ex Libris is a series of small scale installations in very confined spaces. The series emerges out of the contemporary technological movement from text based to visual/digital based cultural transmission. In this work text and a visual vocabulary are brought together. What was a readable book becomes a closed container. Original text becomes context for a series of visual narratives. 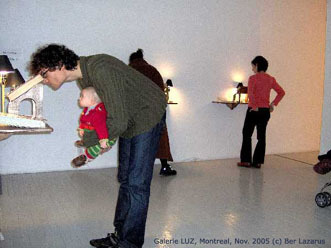 Through its presentation Ex Libris also brings viewers into intimate physical proximity with the work. This shifts the spectator away from the traditional viewing stance of standing back and looking straight ahead. Viewers must approach, bend at the waist and look through the view-finder to access the interior work. In this series each book's pages have been removed and replaced with found objects and images. The space is sealed. Access to the inner space is through a viewfinder inserted in the spine. The book is mounted on a reverse lectern. The interior is illuminated by a lamp. The original text, the body of the book, is preserved under plexi-glas next to the lectern.I am interested in form and scale and in the inter-relationships of objects in any given space. I am fascinated by how we seem to always find ways of creating intimate spaces for ourselves which are usually filled with objects, as if the objects themselves provide the intimacy we seek.